This article is about the play by Euripides. For other plays of the same name, see Medea (disambiguation). Medea (Ancient Greek: Μήδεια, Mēdeia) is an ancient Greek tragedy written by Euripides, based upon the myth of Jason and Medea and first produced in 431 BC. The plot centers on the actions of Medea, a former princess of the "barbarian" kingdom of Colchis, and the wife of Jason; she finds her position in the Greek world threatened as Jason leaves her for a Greek princess of Corinth. Medea takes vengeance on Jason by murdering Jason's new wife as well as her own children, after which she escapes to Athens to start a new life. Medea and the suite of plays that it accompanied in the City Dionysia was not well received at its original performance. [further explanation needed] The play was re-discovered in Augustan drama, and again in 16th-century Europe, from which time it remained part of the tragedic repertoire, and became a classic of the Western canon and has remained the most frequently performed Greek tragedy through the 20th century. It experienced renewed interest in the feminist movement of the late 20th century, being interpreted as a nuanced and sympathetic portrayal of Medea's struggle to take charge of her own life in a male-dominated world. The play holds the American Tony award record for most wins for the same female lead character, with Judith Anderson winning in 1948, Zoe Caldwell in 1982, and Diana Rigg in 1994. Medea was first performed in 431 BC at the City Dionysia festival. Here every year three playwrights competed against each other, each writing a tetralogy of three tragedies and a satyr play (alongside Medea were Philoctetes, Dictys and the satyr play Theristai). In 431 the competition was among Euphorion (the son of famed playwright Aeschylus), Sophocles (Euripides' main rival) and Euripides. Euphorion won, and Euripides placed last. While Medea is considered one of the great plays of the Western canon, the Athenian audience did not react so favorably, and it placed third out of the three competing plays at the Dionysia festival of 431 BC. A possible explanation is found in a scholium to line 264 of the play, which asserts that Medea's children were traditionally killed by the Corinthians after her escape; Euripides' apparent invention of Medea's filicide might have offended its audience just as his first treatment of the Hippolytus myth did. That Euripides and others took liberties with Medea's story may be inferred from the 1st century BC historian Diodorus Siculus: "Speaking generally, it is because of the desire of the tragic poets for the marvellous that so varied and inconsistent an account of Medea has been given out." A common urban legend claimed that Euripides put the blame on Medea because the Corinthians had bribed him with a sum of five talents. In the 4th century BC, South-Italian vase painting offers a number of Medea-representations that are connected to Euripides' play — the most famous is a krater in Munich. However, these representations always differ considerably from the plots of the play or are too general to support any direct link to the play of Euripides – this might reflect the judgement on the play. However, the violent and powerful character of princess Medea, and her double nature — both loving and destructive — became a standard for the later periods of antiquity and seems to have inspired numerous adaptations. With the rediscovery of the text in 1st-century Rome (the play was adapted by the tragedians Ennius, Lucius Accius, Ovid, Seneca the Younger and Hosidius Geta, among others), again in 16th-century Europe. The form of the play differs from many other Greek tragedies by its simplicity: All scenes involve only two actors, Medea and someone else. The Chorus (A staple in Greek theater) would also usually be involved along with those two, representing the women of Corinth. These encounters serve to highlight Medea's skill and determination in manipulating powerful male figures to achieve her own ends. The play is also the only Greek tragedy in which a kin-killer makes it unpunished to the end of the play, and the only one about child-killing in which the deed is performed in cold blood as opposed to in a state of temporary madness. Euripides' characterization of Medea exhibits the inner emotions of passion, love, and vengeance. The character of Medea has variously been interpreted as either fulfilling her role of "mother and wife" and as acting as a "proto-feminist". Feminist readings have interpreted the play as either a "sympathetic exploration" of the "disadvantages of being a woman in a patriarchal society", or as an expression of misogynist attitudes. In conflict with this sympathetic undertone (or reinforcing a more negative reading) is Medea's barbarian identity, which would antagonize[need quotation to verify] a 5th-century Greek audience. Medea is centered on a wife's calculated desire for revenge against her unfaithful husband. The play is set in Corinth some time after Jason's quest for the Golden Fleece, where he met Medea. The play begins with Medea in a blind rage towards Jason for arranging to marry Glauce, the daughter of Creon (king of Corinth). The nurse, overhearing Medea's grief, fears what she might do to herself or her children. Creon, in anticipation of Medea's wrath, arrives and reveals his plans to send her into exile. Medea pleads for one day's delay and eventually Creon acquiesces. In the next scene Jason arrives to explain his rationale for his apparent betrayal. He explains that he couldn't pass up the opportunity to marry a royal princess, as Medea is only a barbarian woman, but hopes to someday join the two families and keep Medea as his mistress. Medea, and the chorus of Corinthian women, do not believe him. She reminds him that she left her own people for him ("I am the mother of your children. Whither can I fly, since all Greece hates the barbarian? "), and that she saved him and slew the dragon. Jason promises to support her after his new marriage, but Medea spurns him: "Marry the maid if thou wilt; perchance full soon thou mayst rue thy nuptials." In the following scene Medea encounters Aegeus, King of Athens. He reveals to her that despite his marriage he is still without children. He visited the oracle who merely told him that he was instructed “not to unstop the wineskin’s neck.” Medea relays her current situation to him and begs for Aegeus to let her stay in Athens if she gives him drugs to end his infertility. Aegeus, unaware of Medea's plans for revenge, agrees. Medea then returns to plotting the murders of Glauce and Creon. She decides to poison some golden robes (a family heirloom and gift from the sun god Helios) and a coronet, in hopes that the bride will not be able to resist wearing them, and consequently be poisoned. Medea resolves to kill her own children as well, not because the children have done anything wrong, but because she feels it is the best way to hurt Jason. She calls for Jason once more and, in an elaborate ruse, apologizes to him for overreacting to his decision to marry Glauce. When Jason appears fully convinced that she regrets her actions, Medea begins to cry in mourning of her exile. She convinces Jason to allow her to give the robes to Glauce in hopes that Glauce might get Creon to lift the exile. Eventually Jason agrees and allows their children to deliver the poisoned robes as the gift-bearers. Forgive what I said in anger! I will yield to the decree, and only beg one favor, that my children may stay. They shall take to the princess a costly robe and a golden crown, and pray for her protection. In the next scene a messenger recounts Glauce and Creon's deaths. When the children arrived with the robes and coronet, Glauce gleefully put them on and went to find her father. Soon the poisons overtook Glauce and she fell to the floor, dying horribly and painfully. Creon clutched her tightly as he tried to save her and, by coming in contact with the robes and coronet, got poisoned and died as well. Alas! The bride had died in horrible agony; for no sooner had she put on Medea's gifts than a devouring poison consumed her limbs as with fire, and in his endeavor to save his daughter the old father died too. I do not leave my children's bodies with thee; I take them with me that I may bury them in Hera's precinct. And for thee, who didst me all that evil, I prophesy an evil doom. Manifold are thy shapings, Providence! / Many a hopeless matter gods arrange / What we expected never came to pass / What we did not expect the gods brought to bear / So have things gone, this whole experience through! ^ This theory of Euripides' invention has gained wide acceptance. See (e.g.) McDermott (1989), p. 12; Powell (1990), p. 35; Sommerstein (2002), p. 16; Griffiths (2006), p. 81; Ewans (2007), p. 55. ^ "Korinthian Women and the Plot Against Medea". Sententiaeantiquae.com. 26 March 2017. Retrieved 1 June 2018. ^ Hall, Edith. 1997. "Introduction" in Medea: Hippolytus ; Electra ; Helen Oxford University Press. pp. ix–xxxv. ^ Macintosh, Fiona (2007). "Oedipus and Medea on the Modern Stage". In Brown, Sarah Annes; Silverstone, Catherine (eds.). Tragedy in Transition. Malden, Mass. : Blackwell. p. 193. ISBN 978-1-40-513546-7. [Medea] has successfully negotiated her path through very diverse cultural and political contexts: either by being radically recast as 'exemplary' mother and wife, or by being seen as proto-feminist wrongly abandoned by a treacherous husband. ^ Williamson, Margaret (1990). "A Woman's Place in Euripides' Medea". In Powell, Anton (ed.). Euripides, Women, and Sexuality (1st ed.). London, UK: Routledge. pp. 16–31. ISBN 0-415-01025-X. ^ "Electric Medea holds the stage". The Globe and Mail, July 3, 1978. ^ Ned Chaillet (January 1982). "Review of Medea". The Times retrieved from Gale – via Internet Archive. ^ RS Rosemary Say (24 January 1982). "Womens` Worlds review of Medea". The Sunday Telegraph pg.12 from the Telegraph Historical Archives from Gale – via archive,org. ^ RS Rosemary Say (24 January 1982). "Womens` Worlds review of Medea". The Sunday Telegraph pg.12 from Telegraph Historical Archives from Gale – via archive,org. ^ RS Rosemary Say (24 January 1982). "Womens` Worlds review of Medea pg.12". The Sunday Telegraph – via The Sunday Times. ^ "Live performance of Angelique Rockas as Medea". Medea. 24 January 1982 – via Internet Archive. ^ Tom Vaughan (28 January 1982). "Medea's Revenge". The Morning Star – via Internet Archive. ^ Dunning, Jennifer. "KABUKI AND NOH FLAVOR A 'MEDEA' IN CENTRAL PARK". Nytimes.com. Retrieved 1 June 2018. ^ "Shozo Sato". theatre.illinois.edu. Retrieved 1 June 2018. ^ "Chicago Tribune - Historical Newspapers". Archives.chicagotribune.com. Retrieved 1 June 2018. ^ Brown, Joe (19 July 1985). "'Kabuki Medea': Furious Fusion". Washingtonpost.com. Retrieved 1 June 2018. ^ a b c d e From the programme and publicity materials for this production. ^ Kaggelaris, N. (2017). ""Euripides in Mentis Bostantzoglou's Medea", [in Greek] Carpe Diem 2:". Academia.edu. pp. 379–417. Retrieved 1 June 2018. ^ David Littlejohn (26 December 1996). "John Fisher: The Drama of Gender". Wall Street Journal. ^ Archive of the National Theatre of Greece, Euripides' Medea – Worldwide tour dates and venues (in Greek). ^ Archive of the National Theatre of Greece, Photo of Kostas Triantafyllopoulos as Creon in Euripides' Medea at the State Theatre of Sydney, Australia on 22 – 24 May 1998"]. ^ Medea: Anguish, Freeze-Dried and Served With Precision – New York Times review on Medea accompanied with a picture of Karyofyllia Karambeti (Medea) with Kostas Triantafyllopoulos (Creon) from the opening night at City Center Theatre, Manhattan, New York on 23 September 1998. Peter Marks (picture by Michael Quan), The New York Times, 25 September 1998. Retrieved 10 December 2010. ^ "Theatre Loans - Logbook Loans Provider". Theatrebabel.co.uk. Retrieved 1 June 2018. ^ "paperStrangers Performance Group". Web.archive.org. 22 August 2012. Retrieved 1 June 2018. ^ "이혜영 "'메디아'는 일생일대의 도전…신화 아닌 오늘날 이야기"" (in Korean). Asiae. 13 February 2017. Retrieved 26 February 2017. ^ "Medea". IMDb.com. Retrieved 1 June 2018. ^ "OedipusEnders - BBC Radio 4". BBC. Retrieved 1 June 2018. ^ "The Internet Classics Archive - Medea by Euripides". classics.mit.edu. Retrieved 1 June 2018. ^ Euripides, 480? BCE-406 BCE (16 February 2005). "The Tragedies of Euripides, Volume I." Project Gutenberg. Retrieved 1 June 2018. ^ Euripides; Murray, Gilbert (1 June 2018). "The Medea. Translated into English rhyming verse with explanatory notes by Gilbert Murray". New York Oxford University Press. Retrieved 1 June 2018 – via Internet Archive. ^ "Medea and Other Plays". Penguin Classics. 30 August 1963. Retrieved 1 June 2018 – via Amazon. ^ "Medea Μήδεια". Bacchicstage.wordpress.com. 25 February 2011. Retrieved 1 June 2018. ^ "Medea by Joseph Goodrich - Playscripts Inc". Playscripts.com. Retrieved 1 June 2018. ^ "Encore -- Euripides: Hecuba, Electra, Medea / adapted into English verse by Brian Vinero". Nypl.bibliocommons.com. Retrieved 1 June 2018. ^ Fisher, Mark (3 October 2012). "Medea – review". the Guardian. Retrieved 1 June 2018. DuBois, Page (1991). Centaurs and Amazons: Women and the Pre-History of the Great Chain of Being. University of Michigan Press. ISBN 0-472-08153-5. Gregory, Justina (2005). A Companion to Greek Tragedy. Wiley-Blackwell. ISBN 1-4051-0770-7. Hall, Edith (1991). Inventing the Barbarian: Greek Self-definition through Tragedy. Oxford University Press. ISBN 0-19-814780-5. Mastronarde, Donald (2002). Euripides: Medea. Cambridge University Press. ISBN 0-521-64386-4. McDonald, Marianne (1997). "Medea as Politician and Diva: Riding the Dragon into the Future". In Ckauss, James; Johnston, Sarah Iles (eds.). Medea: Essays on Medea in Myth, Literature, Philosophy, and Art. Princeton University Press. ISBN 0-691-04376-0. Mitchell-Boyask, Robin (2008). Euripides: Medea. Translated by Diane Arnson Svarlien. Hackett Publishing. ISBN 0-87220-923-7. Powell, Anton (1990). Euripides, Women and Sexuality. Routledge Press. ISBN 0-415-01025-X. Rabinowitz, Nancy S. (1993). Anxiety Veiled: Euripides and the Traffic in Women. Cornell University Press. ISBN 0-8014-8091-4. Saïd, Suzanne (2002). "Greeks and Barbarians in Euripides' Tragedies: The End of Differences?". In Harrison, Thomas (ed.). Greeks and Barbarians. Translated by Antonia Nevill. Taylor & Francis. ISBN 0-415-93959-3. Mossman, Judith (2011). Medea: Introduction, Translation and Commentary. Warminster: Aris & Phillips. ISBN 978-0-856-68788-4. 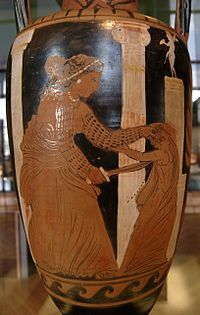 Wikimedia Commons has media related to Medea (Euripides). This page was last edited on 3 April 2019, at 21:33 (UTC).